Jess combines her background in both conservation ecology and animal behaviour to try and tackle the issue of human-wildlife conflict in Botswana. Jess has a BSc in Geography and an MSc in Conservation from the University of London. She has previously conducted fieldwork studies in Kenya and Tanzania, as well as spending a year at the Kalahari Meerkat Project in 2008. In 2014 she completed her PhD studies on the evolution of cognitive ability, using a species of Australian bowerbird as a model species. She returned to Africa in 2014, taking up the position of Project Manager at NGO Elephants for Africa, where she devised and delivered their Community Coexistence Project, as well as managing a field camp and leading a small team of researchers investigating the social behaviour of male elephants. 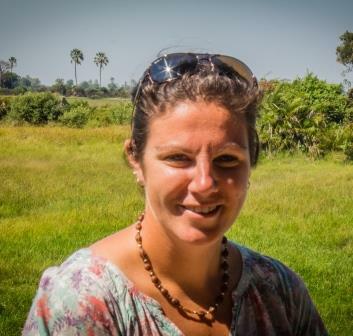 Jess joined WildCRU’s Trans Kalahari Predator Programme in 2017 as the Coexistence Coordinator. Her role focuses on tackling human-lion conflict in hotspot areas of Botswana, developing and implementing the model successfully applied in and around Hwange National Park in Zimbabwe.